Yesterday, I had the privilege of representing Santa at the CHC Holiday Party in Middletown. It was one of many holiday parties CHC has been holding at its sites across Connecticut, and my third time representing Santa in Middletown. Perhaps, however, I should use the older name, St. Nicholas. For me, Santa has always been problematic. Santa has always been the guy at the suburban shopping mall that privileged parents bring their kids to during a shopping spree. For those of us growing up in more difficult circumstances, Santa was a symbol of disappointed hopes. St. Nicholas, upon whom Santa is based, was a Bishop in the early Christian Church well known for his loving care for children, especially those in the greatest need. As I sat in my Santa outfit in the big red chair in the community room of CHC Middletown, I thought about St. Nicholas. I thought of the children I had seen in other years and stories about how for some of them, the gift they would get at our holiday party might be the only gift they would receive this Christmas. I thought about the photo I had taken e arlier in the day. 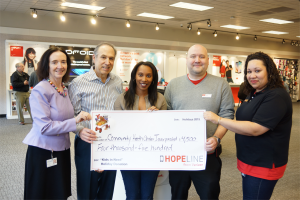 Verizon’s HopeLine had contributed $4,500 to our domestic violence program to help victims of domestic violence in our community have a brighter holiday. Our staff also contributed many gifts and Hasbro provided gifts at a steep discount. I thought of my friend who had struggled for so long to become pregnant, only to have her son, Isaac, born prematurely and die soon afterwards. She channeled some of her grief into getting presents for children in need. I held all these things in my heart as I smiled and winked at children eager for some hope, love, and affirmation. I held all these things in my heart as I asked them how they had made other people happy, as I gave them hugs and told them I had been waiting for them, that they were special, and that I loved them. 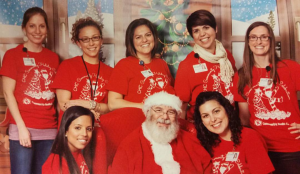 A group of CHC employees worked hard as Santa’s helpers to make this a magical event. It is clear how my coworkers helped make many people happy. By the end of the day, over two hundred children visited, and I knew in my heart, “Isaac was here”.